Finding a gift for someone special who’s a golf lover can be quite confusing, either because golfing equipment can be too expensive or too personal and complicated. For the recipient of such gifts it gets more and more difficult to feign surprise and unmitigated glee when given yet another – often quite useless – gizmo or piece of loosely related golfing memorabilia. The problem is that golfing equipment, along with the various tried and tested accessories that make up an avid golfers `kit’, are usually very personal to the individual golfer. Not only does he or she come in all kinds of different shapes and sizes, short & stocky, tall & slim, etc. they will also all have reached very different standards of playing golf. So what might appear to you (the non-golfer) to be highly suitable and desirable top golf themed gift ideas for the recipient of such gifts – whether golf gifts for men specifically, or a beginning golfer, intermediate golfer, or even a low single figure-to-scratch golfer – the `must-have-factor’ is bound to be miles apart. Often leaving you with very limited choices. To help you out we have listed various golf related gifts that you can buy from small gadgets to high end accessories that can make a big difference to their game. To keep his or her favourite golfing equipment and accessories safe and sound when traveling to and from different golf courses, home or abroad, a hard-sided travel case is one those really practical top gift ideas. The hard case travel cover gives ultimate protection to your golf clubs. Designed to fit up to a 10″ golf bag and a 46″ driver length, this extremely versatile custom golf gift travel cover comes with three heavy duty locks and two retractable handles and is the best way to protect your golf clubs on any journey. This golf club travel case comes complete with a durable leather luggage tag attached so should your golf equipment ever go missing en-route anywhere it can easily be identified and safely returned. 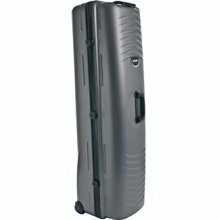 The hard-sided travel case will endure the roughest handling by aircraft luggage handlers ensuring that all your beloved golfing kit will get to the intended destination all in one piece. So, for the traveling golfer in your life a hard-sided travel case would be one perfect golf themed gift! High Tech Golf Gadgets To Improve Your Golf Game! Stepping up the value range a touch more, your golfing partner or beloved relative (golf gifts men?) will absolutely LOVE receiving this latest piece of golf tech which will undoubtedly help to improve their overall golf game. According to the manufacturers, this neat looking high tech golf gadget is the world’s first Laser Rangefinder and GPS in one. 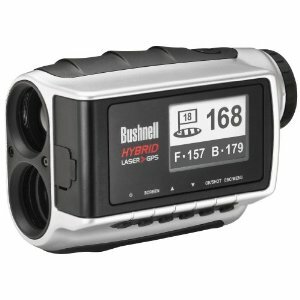 Combining laser accuracy with golf GPS convenience, the Bushnell Golf Hybrid GPS Laser Range Finder could be just the game-changer your loved-one needs to take their game to another level. It will not only help them to find their way around the golf course, it will also take the guess work out of picking the correct wedge or iron for the distance left to the chosen target. This is really going to help with lowering their overall golf scores – whilst at the same time cementing your gift golfer relationship for years to come! Now this next golf themed gift really is right out of the `top-drawer’ of top gift ideas. If you’ve the budget to organise, and perhaps even pay for (partially, if not in full) a golfing trip to this world-renowned Irish golf course – Ballybunion in County Kerry – this is one of those golf themed gifts of a lifetime which will very soon have you becoming THE special person in his or her life – forever!! The famous `Old Course’ at Ballybunion Golf Club in County Kerry, with it’s famous first hole tee shot with the ancient cemetery featuring along the right side of the hole, calls for nerves of steel to keep the shot on the fairway. Failure to do so will see you having to pay your due respects for a wayward one! See your golf swing from close up to help you eradicate any faults! 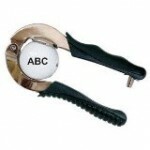 With this handy piece of golf tech you can now correct your golf swing faults whilst you’re out on the golf course. 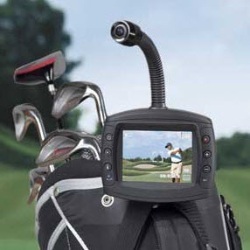 The hands-free video recorder mounts easily to a golf bag, pull trolley, or golf cart. Featuring one button recording and frame-by-frame playback, the golfer in your life will soon be able to accurately analyse their golf swing – even during their round – to help keep them on track. The recorder captures the entire body and golf swing from six feet away. The resultant captured footage can either be played back through the built-in screen or a convenient TV or computer. The recorder features an exclusive `gooseneck’ mounting to enable the user to bend the digital camera in all directions. Because the camera is able to rotate thru’ 270 degrees you can set up and record things quickly. See your swing at every possible point as the high-speed frame rate delivers detailed stop-action video. Play back your video frame-by-frame in both forward and reverse. Hopefully, this selection of golf themed gifts and top gift ideas should help to soon see you back in the good books of that special golf-nut in your life and for a long, long time to come! Searching for top gift ideas or reasonable golf gifts that won’t break the bank might seem like a simple task – at first. But it seems as though most websites that specialise in the golf accessories gift market only sell the most expensive products making the prospect of buying high-quality yet affordable golf themed gifts seem like a downright impossibility. 1. Personalised Golf Balls. If you’re looking for a budget-friendly and reasonable golf gift– which are often categorised as gag golf gifts – nothing beats personalised golf balls. Check out your local sporting goods store and ask if they can personalise the golf balls, or check out online websites that offer these services. It’s a great way to offer an affordable gift golfer’s who have a love for the game will find appealing. 2. GPS Golfing Gadgets. Do you have a little more cash to spend on gifts for the golfer in your life? 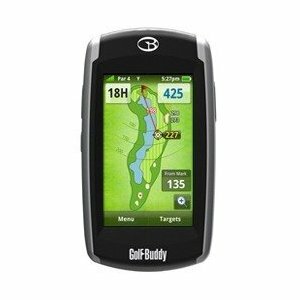 Then splash out on a GPS golfing gadget which is one of those golf gifts men are bound to have at the top of their wish list. A custom golf gift GPS golf gadget such as this allows the golfer to see an expansive overhead view of any particular golf course, including the layout, distance, and any hazards. Most of these golfing gadgets can be programmed to include any golf course in the world, so that special golfer in your life will be able to study up on their favorite course before their allotted tee time, be it in Europe or North America. 3. Golf Bag Alarm. As any golf fan knows, there are plenty of times when one has to leave their gadgets and clubs left unattended. As far as reasonable golf gifts go, the golf bag alarm is certainly a present that will allow the golfer in your life to play in peace. The innovative alarm can be locked to any personal belonging; if the lock is tampered with in any way, it lets off an alarm, which causes the key fob to vibrate. It’s a great way for any golfer to keep their possessions safe and sound while they’re enjoying their game of golf and would make superb golf gifts for Dad. 4. Golf Ball Warmer. If you’re looking for a reasonable golf gift, that just happens to be an indispensable tool used by the golfing professionals, then get the gift of a golf ball warmer. Experts in the golf accessories gift market have insisted that hitting a cold golf ball results in shorter drives – and now evidence backs it up. Warmers heat up golf balls to internal temperatures of up to 100°F, which results in a 15% longer drive. As any golfer knows, that 15% can make all the difference in a successful game. So, you can bet that this particular golfing gadget is certain to be among the most appreciated golf gifts for men who are forever seeking that extra distance off the tee and is bound to be received with absolute delight. Now here’s a golf themed gift which both golfers and non-golfers alike can enjoy! 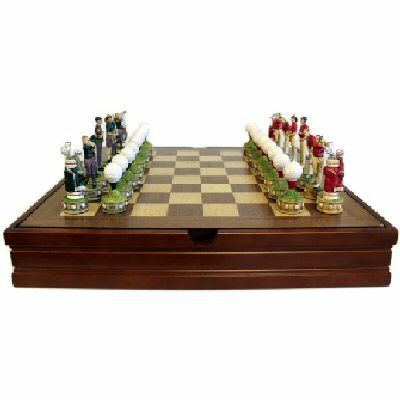 This beautiful, wooden chess set has playing pieces depicting golf themed characters. Each piece has been crafted with exceptional attention to detail and hand painted. 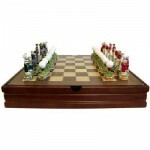 The playing board is a box style with a lacquered finish. Perfect for passing from one generation to the next and a suitable gift idea for all ages. Dreaming of fairways and greens whilst stuck on your computer? Now this is one of those really quirky golf themed gifts that is certain to put a genuine smile of delight on the face of that special person in your life once they’ve carefully unwrapped it. The golf ball shaped mouse and mouse mat has to be among the most novel top gift ideas you will have ever seen. 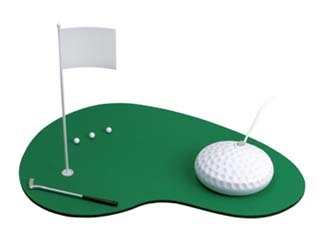 The mouse itself is shaped like a flatish golf ball and the mouse mat is a miniature putting green. 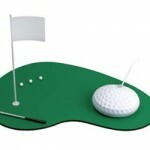 A flag, hole, mini golf ball and mini putter are included in the package. Imagine your golfing friend or partner getting bored at work, which we all probably do on a daily basis, and then being able to chill out whilst practising their putting skills. The benefits are twofold. Firstly, it fills in the down-times at work and secondly it will help them hone their social skills; acting as an `icebreaker’ during interviews or interminable monthly reviews. You never know, it might also help with mixing in with the executives of the company perhaps leading to a better paid job! Short Game Instruction – Available from many of the most respected short-game `gurus’ in the game of golf, these E-books have been written by true expert in the short game. One such well known guru is a former engineer who spent many hours compiling statistical facts and figures about the various ways there are of lowering your scores during a game of golf by simply mastering the art of the short pitch and chip shots around the green. There are detailed explanations on how to successfully perform each different technique. Putting Instruction – There are also a number of terrific putting instruction E-books available by popularly acknowledged short-game experts. These E-books concentrate only on putting. Everything the golf player needs to know from reading the greens to how to ingrain a silky smooth putting stroke to help rapidly lower your scores. Some of these E-Books run to four hundred pages or more in length and can be one of those golf themed gifts which are not only useful for golfers of all standards, they also represent excellent value for money as well! These are just a small selection of golf themed gifts to suit every budget – large or small – which you might want to consider for that golf-mad special person in your life. The sheer thoughtfulness of which, if nothing else, is bound to earn you their utmost respect and undying gratitude! Previous Post:Golf Practice Mats – A Welcome Addition to your Yard!